What home is complete without the Pink Flamingo? Set includes one standing and one feeding bird made from sturdy salmon-pink plastic. Standing flamingo measures 35 inches tall overall, and about 30 inches tall when legs are staked in the ground. Feeding flamingo measures about 17 inches from tail to beak and both are about 4 inches wide. Each flamingo has metal legs, realistic black and yellow plastic eyes, painted beaks and lots of feather texture molded in. 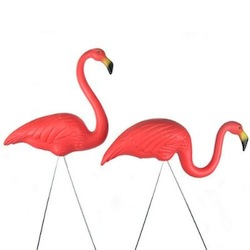 These are the original "Yard Art" flamingos (phoenicopteris ruber plasticus) designed by Don Featherstone with his signature molded underneath. The ultimate kitsch accessory for your front yard or garden! Made in the USA using the original Union Products molds.